Thomas Webb, Secretary of the New England Emigrant Aid Society, wrote from Boston to Hiram Hill in Williamsburgh, Massachusetts. 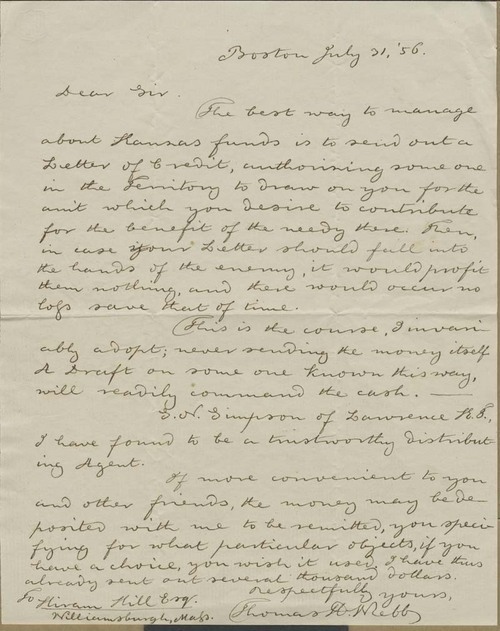 Webb advised him on the best way to send monetary aid to Kansas, which would take the form of a Letter of Credit and would keep the enemy from obtaining the money even if the Letter were captured. In another alternative, Webb also offered to purchase with Hill's money actual supplies to be shipped out to Kansas.